Most Appraisal Management Companies handle only residential appraisals. 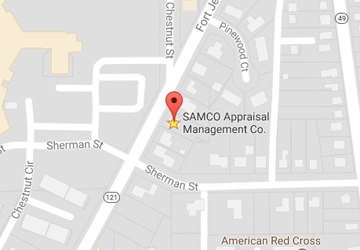 SAMCO Appraisal Management Company can also order and review Evaluations for Consumer Lending. Evaluations are completed by a licensed real estate professional (Real Estate Salesperson/Broker, Engineer, Auctioneer, etc.) The evaluation format would provide all of the requirements listed above from the 2010 Interagency Appraisal and Evaluation Guidelines, as well as the Auditors Tax Card, and other supporting documentation, such as a prior appraisal. Evaluations are not USPAP reviewed as they are not appraisals. A quality and professionalism score would be given for the Evaluation and the Evaluator as per requirements of the 2010 Interagency Appraisal and Evaluation Guidelines. These residential and commercial evaluation products are suited for small to moderate properties providing a simple, less expensive, and effective, regulatory compliant option for asset monitoring and/or Consumer Lending. Evaluations are not meant to take the place of an appraisal, and would be inappropriate for complex valuation assignments. Contact us to discuss your needs and how our Evaluation product can economically fit your needs, again, at no cost to you as the consumer pays our fee!